The pranksters at Just For Laughs Gags set up a puppet dog at the park to prank real dogs. Watch how the dogs react to the puppet in this comical viral video. Poor dogs! My family lives in Mexican gray wolf country along the banks of the upper Gila River in the Cliff-Gila Valley, three miles from the southern edge of the Gila Wilderness in southwestern New Mexico. We live simply, on a small milk-goat farm, growing most of our own food and selling, what we can, to our neighbors. Our orchards and gardens are filled with free-ranging chickens, turkeys and ducks; and our hearts are filled with gratitude both for the lives we lead and the larger complex of life that surrounds and sustains us. My son, Hawk, is home-schooled and we spend a lot of time outdoors. When Hawk was 4, we went camping in the Gila wilderness. We got lucky. Lying in our sleeping bags after dark, we both heard our first wolf. “What’s that mama?” he asked, a little nervously. “But aren’t you afraid,” he asked? “No,” I said. “I’m not afraid of the wolf, or of mountain lions, or bears, or lightning, or poison ivy. But what I am afraid of is that the wolf that we just heard could be shot. I’m afraid that I will never hear that sound again. I’m afraid that the rivers will be dammed and the soil will be lost and that too many species of birds will disappear forever. Well, OK, maybe I didn’t say all that, but he got the message. He’s not afraid of wolves. Sweet boy, at 10 years old, he’s not even afraid of the future – at least not yet. “The great terror of our age,” wrote Loren Eiseley, “is our own conception of ourselves.” Yes, I care about wolves, but I care about my son even more, and I want him to know that the human heart is large, that our species is special because we get to choose who and what we are, that narrow self-interest, hatred and fear doesn’t have to define the human character, that the Endangered Species Act is not only about recovering the Mexican gray wolf, it’s also about recovering ourselves. I understand that it’s hard sometimes to give the wolf or other listed species a free pass, especially when livelihoods are believed to be at stake. But for me, the Endangered Species Act remains a sacred trust between my family and my government guaranteeing us that the diversity of life contained within our national boundaries will not be diminished by human agency. The protections that the U.S. Fish and Wildlife Service could and should and must provide the Mexican gray wolf on its long road to full recovery is the people’s business. It’s my business. They are working for me, and for Hawk, and for millions of other Americans who not only want a future filled with wolf song, but demand it under the law. The Endangered Species Act is not the jack boot of big government. The Endangered Species Act is me. The jack boots are mine. I’m one who wants the world to stay alive. I want Hawk to know beauty and wonder. I am not afraid of wolves. But I am so very afraid of a future without them. 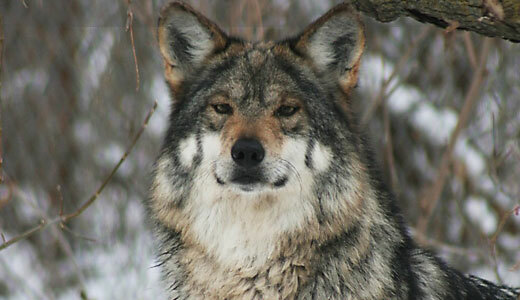 Biodiversity: Some progress for Mexican gray wolves? Biodiversity: Can the courts help save Mexican gray wolves? There Are No Transitional Fossils? Long-sought fossil mammal with transitional middle ear found in China. Palaeontologists have announced the discovery of Liaoconodon hui, a complete fossil mammal from the Mesozoic found in China that includes the long-sought transitional middle ear. The specimen was found by palaeontologists from the American Museum of Natural History and the Chinese Academy of Sciences. It shows the bones associated with hearing in mammals, the malleus, incus, and ectotympanic, decoupled from the lower jaw, as had been predicted, but were held in place by an ossified cartilage that rested in a groove on the lower jaw. Dog fighting is a ‘blood sport‘ where dogs are set against one another in a ring or a pit to entertain sadistic spectators. Money is made by those who organise this brutal activity. Dogs are often stolen from good homes and then used as bait ~ their fear spurring on the other dog made aggressive by human abuse. Although dog fighting is illegal in South Africa it is widespread in certain areas. 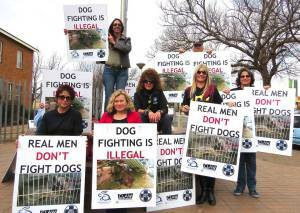 A dog fighting ring was uncovered by the NSPCA (SA) and 18 of the suspected perpetrators are now standing trial. On Monday morning,17th August, I joined protesters at the court with posters of the actual dogs used in the dog fighting. Sadly these dogs had to be euthanized by the NSPCA. Please let there be justice with due punishment for these perpetrators. Yet another sell-out group, sleeping with the enemy. Is this what they’re doing with all the donations they keep begging for? Unbelievable! Save Sea Lion Sanctuary – ForceChange.